12 Adult size bracelets silicone bracelets. ADD Awareness Purple Bracelets Attention Deficit Disorder 12 Piece Lot October is ADD (Attention Deficit Disorder) Awareness month. 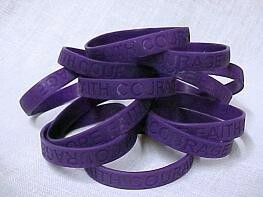 Purple is the awareness color for ADD (Attention Deficit Disorder) 12 Adult Size silicone bracelets. 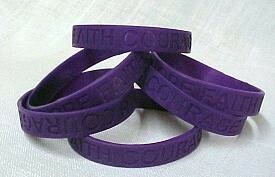 Purple Silicone awareness bracelets have debossed lettering "HOPE FAITH COURAGE". Awareness name is not on the bracelet. Perfect way to show support and promote ADD awareness. We donate a portion of the proceeds to non-profit organizations for research. Fundraising and bulk discounts available. Custom designs available. Please call 1-888-874-6463 for a quote. Custom order delivery approximately 3 weeks.